Heya! 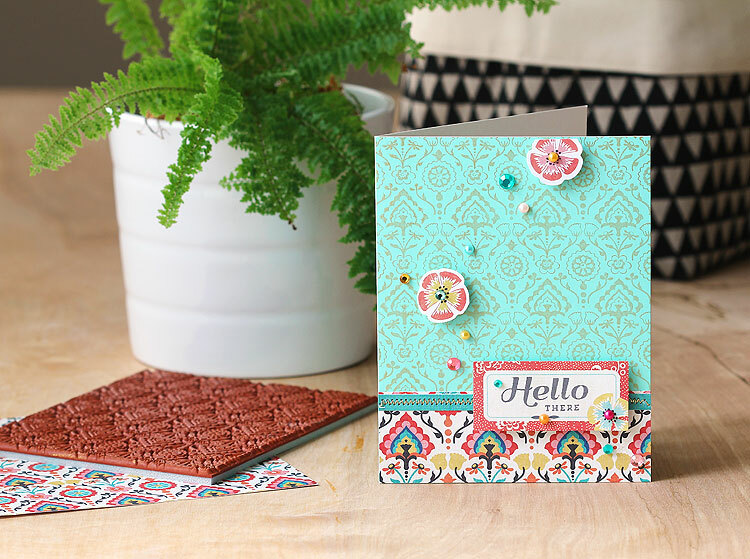 Today Hero Arts and BasicGrey are getting together for a blog hop featuring the new Spice Market collection! I’m so happy to be a part of it — as a member of the Hero DT, when I receive the stamps for each release I must confess to letting out a huge yell now and then when I open up my box — I just love all their releases. BasicGrey must peek inside my head to know just what I’m thinking or something. And this one? Yeah it’s full of awesome too. If you’ve been hopping along with us already then you should have arrived here from Becky’s blog, Page Maps. 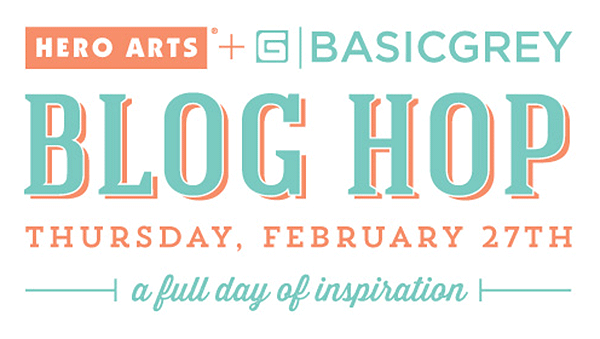 If you’re just now joining us, or you encounter a broken link, head on back to the start of the hop at Hero Arts. 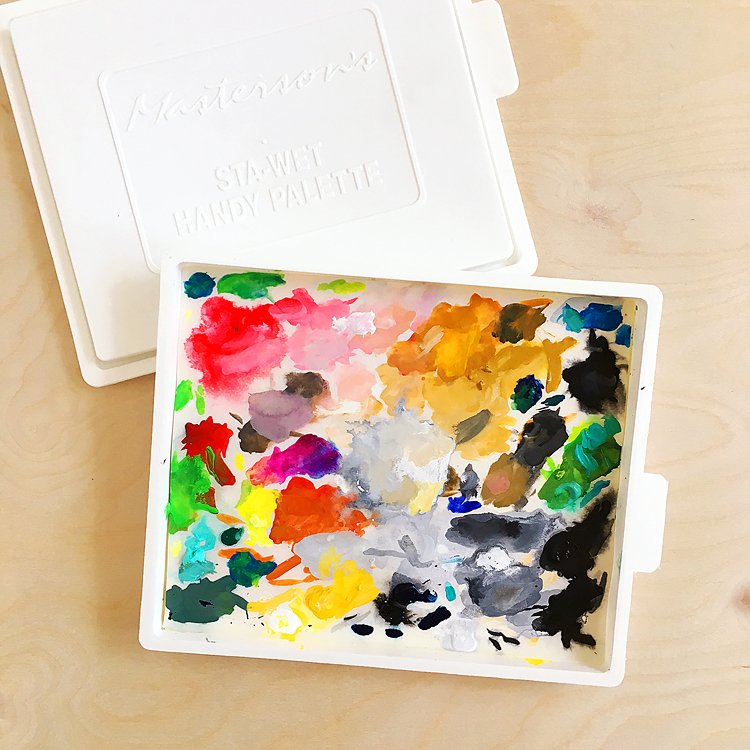 I thought it might be helpful to start off by sharing my process — especially since I’m primarily a cardmaker and I know many of you hopping along aren’t. 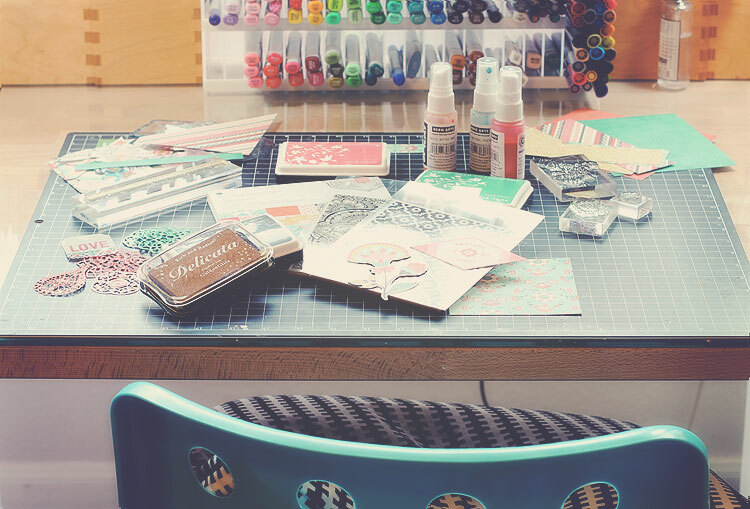 Plus I’ve heard from my fellow cardmakers that they often find it hard to work with patterned paper *and* stamps. So here goes — a behind-the-scenes look at my ultra mega top secret methods. LOL! BasicGrey was so generous and sent us a ton of awesome things to work with. I was seriously drooling. Oh my. 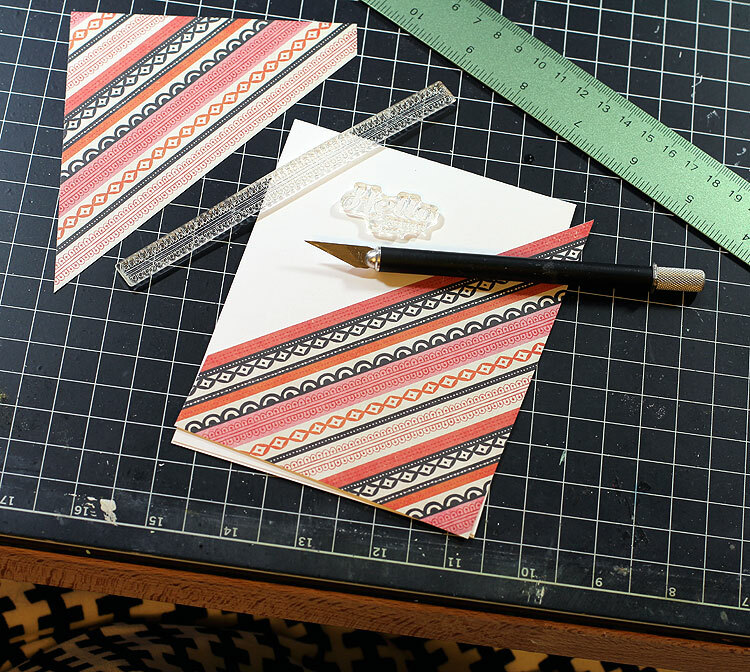 I like to work with the 6×6 pads when making cards as I find that sometimes the patterns are too big on the 12×12. 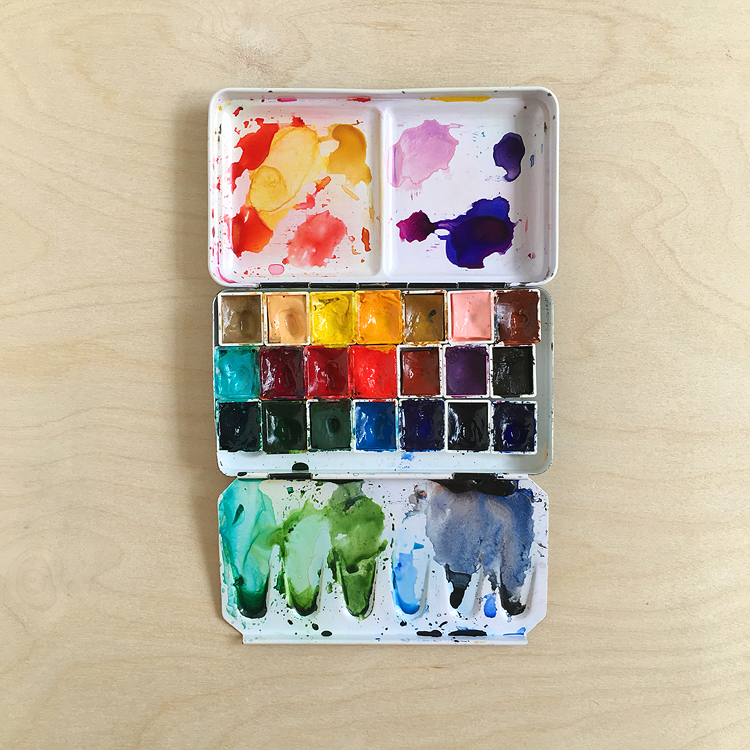 I pull out some papers from the pad and embellishments that really grab me and I figure out what inks I want to use. Sometimes I try to get it to match, and sometimes I think it needs a little contrast. With the Spice Market collection, I thought it needed a little gold — I’ve really been loving the metallic trend lately. 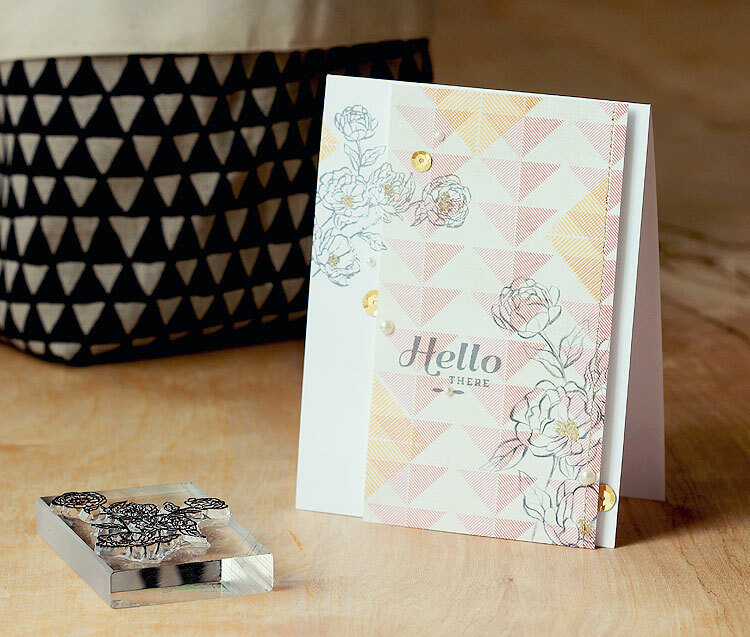 This card is super simple — it all came together when I spied the Deco Background stamp and the coordinating paper in the 6×6 pad. They are just meant to go together. So I grabbed that gold ink I had out and stamped it on a pool notecard. I just had to stop for a moment and admire the metallic shine. 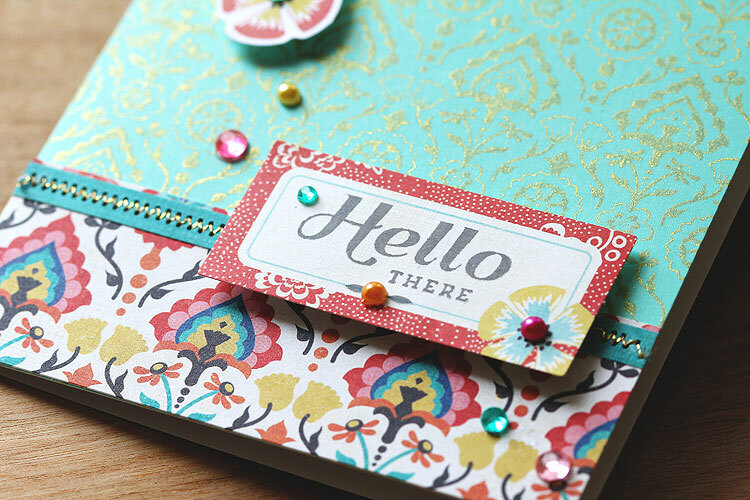 I’ve seen cards in fancy stationery shops that don’t look this good. 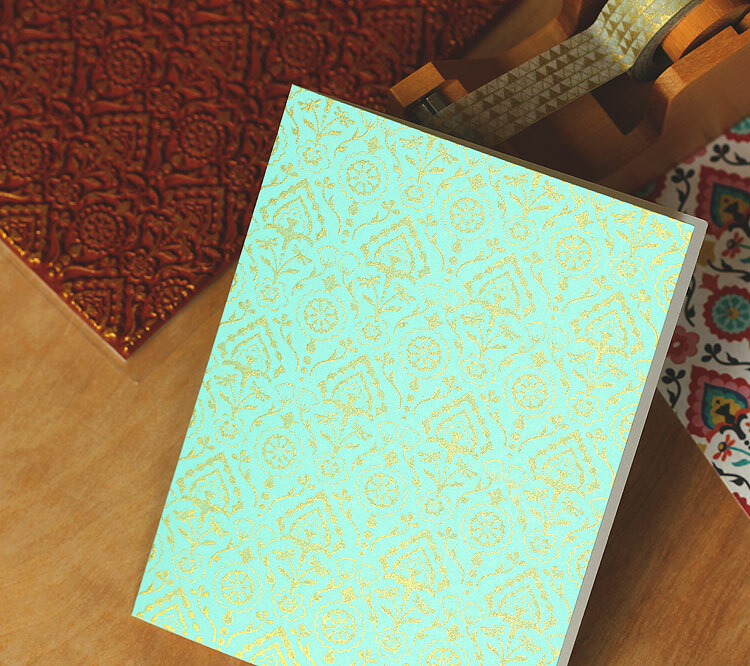 That’s just the ink there — no embossing at all. While you *could* emboss it if you really wanted to, I say be lazy like me and let the ink take the stage. 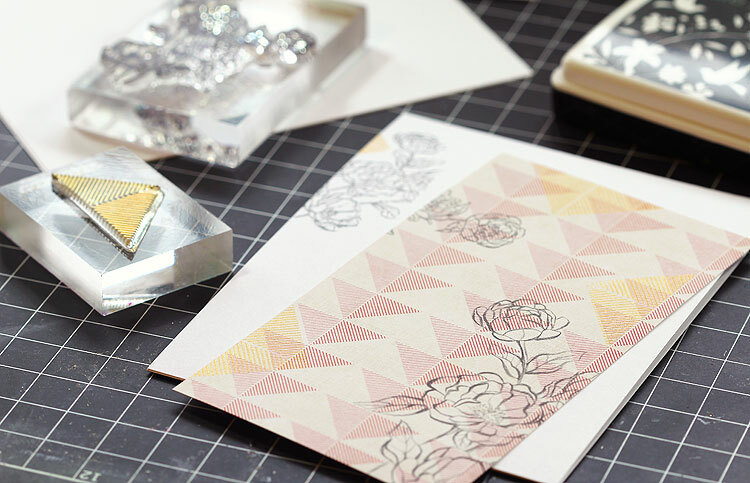 Plus the embossing will hide some of the shimmer. Can’t have that. 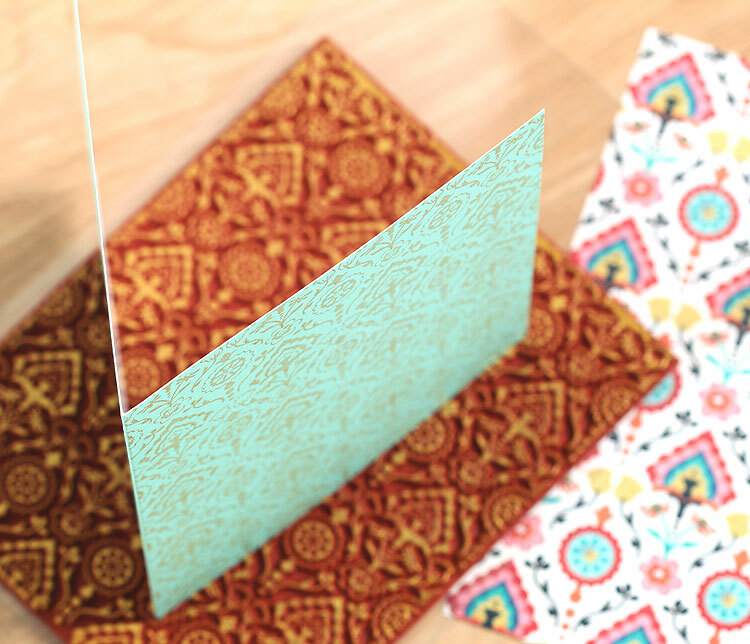 To finish off the card, I trimmed a strip of the matching paper and adhered it plus another strip the card, then added a little sewing with gold metallic thread. 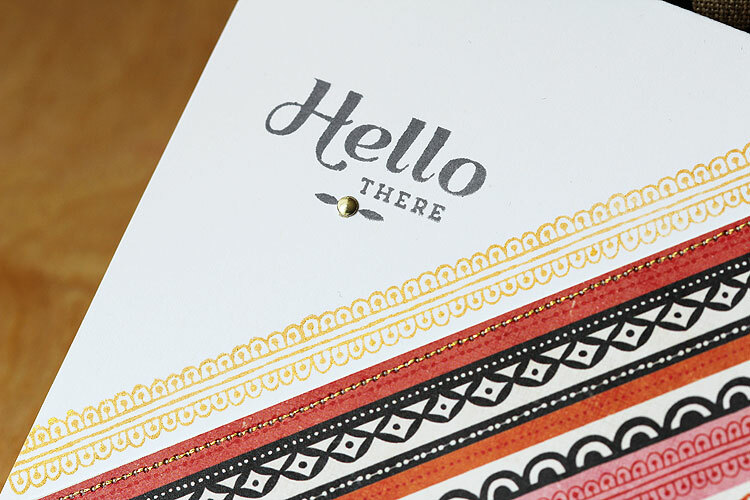 I stamped “hello there” with charcoal ink on an die cut and popped it on the card. Gotta say that I love using charcoal ink — somehow I think it’s so much more sophisticated than regular black. It’s kinda unexpected. Then I added some flower die cuts and some gems and pearls and that was that. One card done! I adhered the bottom corner piece in place, then stamped the border in gold. It didn’t quite reach to the edge, so I cut a hair off the card. 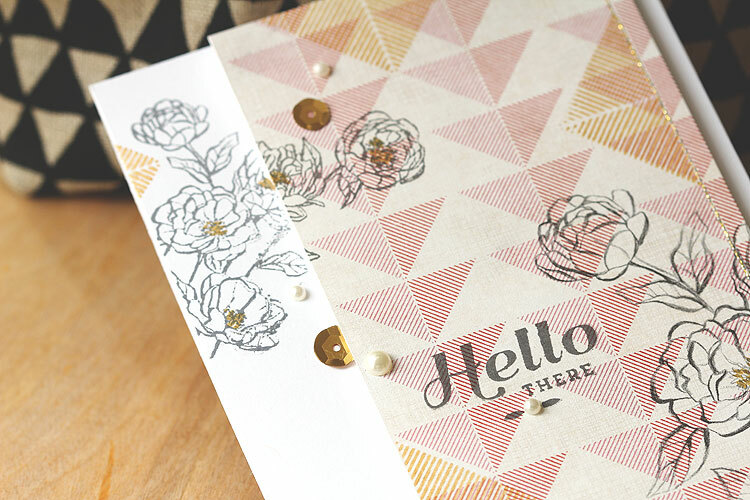 I added a row of gold stitching, then I stamped the border in gold and the “hello there” in charcoal. Added a single gold metallic decor and that was that. I plan on making another card with the other corner piece, too. 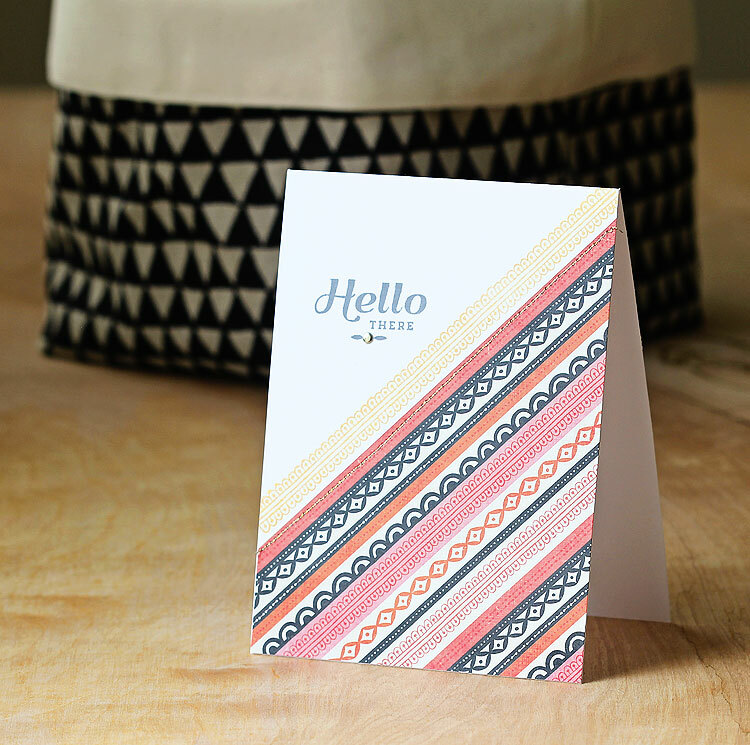 And I just gotta say, this card is perfect for mailing — no extra postage required. 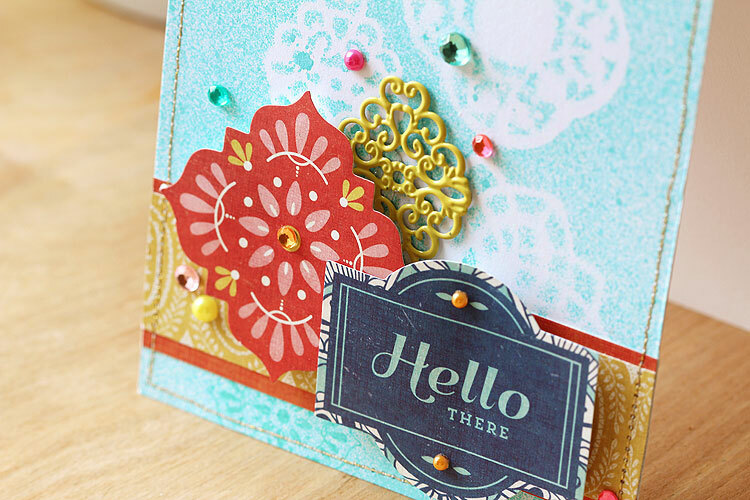 Okay, so this next card just kind of popped into my head as soon as I saw the metal embellishments. I was admiring how gorgeous they are when I had the idea to use them as a mask! So I took them out of the package, removed the adhesive, popped them on the front of a card and misted with tide pool spray. I carefully removed them and ran them under the faucet — they were good as new. Then you know me — I just had to stamp the coordinating stamps from the Best Time Ever and Lovely clear sets on the sprayed background with tide pool ink. Once that was done I played around with positioning on the card. Then adhered everything in place, using pop dots for the paper pieces and a glue dot for the metal embellishment. I finished off the card with some gems and pearls, and that was that. Were you surprised I didn’t use gold ink on this card? I actually thought about using gold ink instead of the tide pool — but I decided against it since the misted shapes are kind of subtle and I wanted the stamping to blend in. 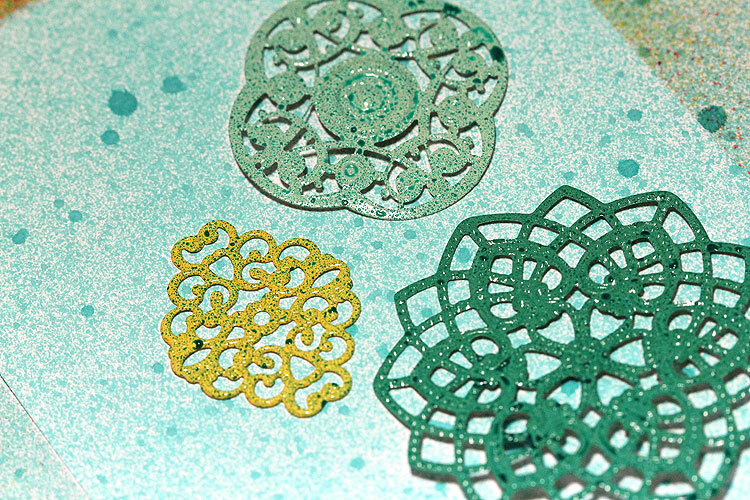 For my last card, I had to do one of my favorite techniques — stamping on patterned paper. After seeing the flower stamp in the Lovely set and the triangle in the Best Time Ever set, well, it just had to be tried. I started off by trimming the paper to 5.5″ tall and then took some off the left side. Then I placed it on a white card without adhering it, and stamped the flowers with charcoal ink. Love doing this little trick! I think the charcoal ink goes perfectly with the paper — so much better than using black don’t you think? After I was finished stamping on the paper, I ran a stitch of gold metallic thread along the right side, following the pattern. Then I adhered it to the card base with foam dots. To place extra emphasis on it, I placed some sequins and pearls so that they were peaking out from under the paper. 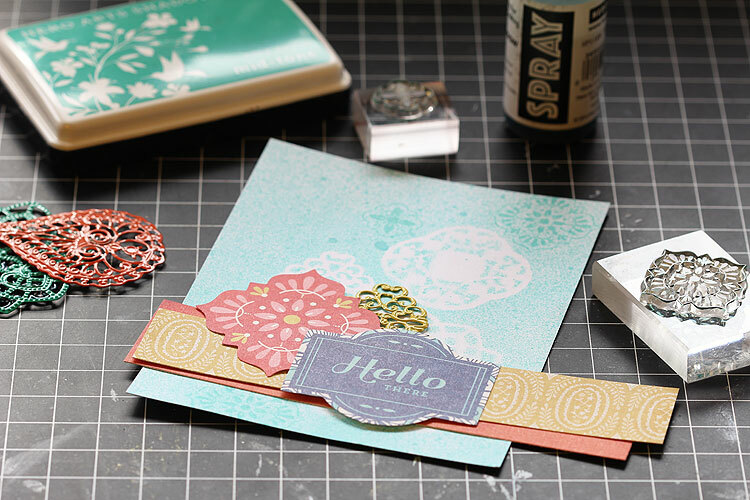 I finished it off by coloring the centers of the flowers with a gold wink of stella pen — just to give it that little something, but without taking away from the simple stamping. And that’s it for my cards! Thanks so much for sticking with me, and hope you enjoyed seeing them as much as I liked making them. 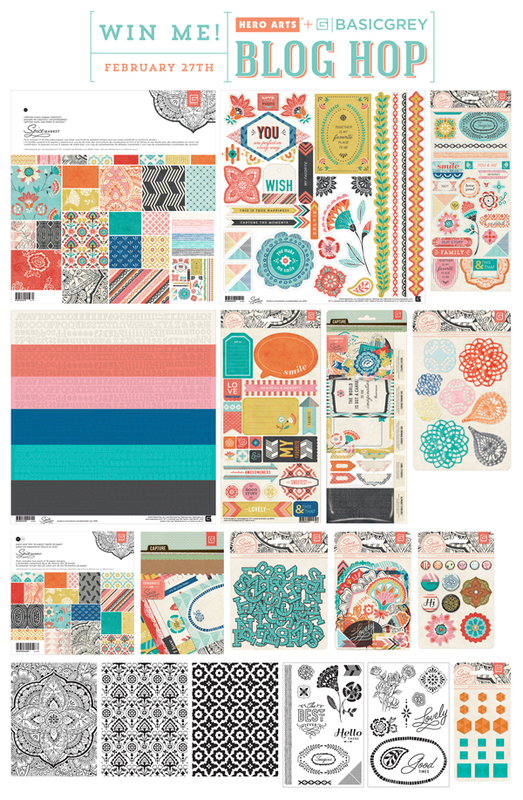 I love the way you use pattern papers. I always have trouble putting them together!